Plan of the Town Plat of Worthington in the State of Ohio from the collections of the Worthington Historical Society (WHS) may be used for educational purposes as long as it is not altered in any way and proper credit is given: "Courtesy of the Worthington Historical Society, Worthington, OH." Prior written permission of the WHS is required for any other use of Plan of the Town Plat of Worthington in the State of Ohio. Contact WHS at info@worthingtonhistory.org to request permission. 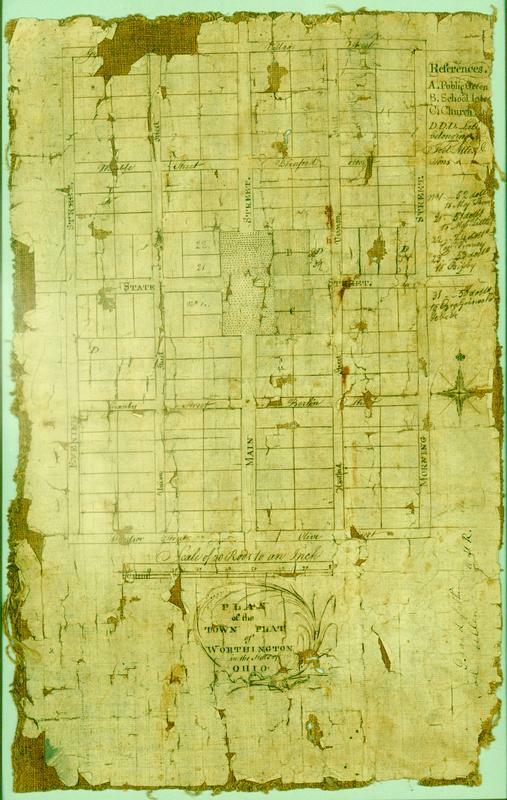 Plan of the Town Plat of Worthington in the State of Ohio is cartographic material, with genre map and manuscript. Its dimensions are 14.25 in. x 9 in.. It was created in 1803. Worthington Historical Society is the Contributor. Joel Allen is the Creator. This map of Worthington on fabric, scale of 20 rods to an inch features original street names. References in top right corner list A. Public Green, B. School lots, C. Church, D.D.D. Lots belonging to Joel Allen and sons. Ohio was a popular destination for people leaving the rocky soil and crowded farmland of New England. Maps and gazetteers provided information for those planning to leave for the new frontier, reassuring them that the new home had the elements of civilization. The map is drawn on paper, backed with linen. Prior to 1800 all paper was handmade from rags. Linen is a very durable fabric. It helps preserve the map and keep it flexible. It covers the topic geography. The Worthington Historical Society identification code is 63-G 83 E.
The Worthington Memory identification code is whs0002. This metadata record was human prepared by Worthington Libraries on November 8, 2001. It was last updated October 24, 2017.